That’s right folks, the DVD Review Show with Marc and Matt is back once again. And to get things started we’re reviewing David Marks “Double Bevel Marquetry”. If you have ever wanted to take a “hands-on-class” with David Marks, although haven’t been able to, than this DVD is as close to the hands on experience as you can get while viewing this in the comfort of your own home. The viewer will feel as if they are in David’s shop getting personal instruction. Art is in the details as is demonstrated by David’s meticulous craftsmanship. 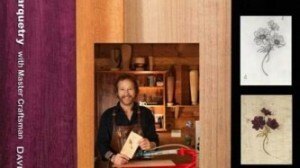 David Marks has been teaching students how to do double bevel marquetry since the mid 1990′s. This 90 minute DVD is a thorough step by step lesson of this process, including how to create your own designs even if you don’t think of yourself as being artistic. Demonstration of cutting thick veneer. Setting up the scroll saw for perfect cuts. Sand shading, gluing , and finishing the surface. There is also a chapter on the work of students that have studied with David as well as some work that has inspired David. Visit www.woodtalkshow.com to listen to the show or download the mp3 file. And while you’re there don’t forget to leave a comment on this or any of our previous episodes of the DVD Review Show also. « It’s like being on the Dean’s List for Forestry!